What is the difference between a contract of service and a contract for service? When is a person employed and when are they a contractor? This fundamental employment law question recently came before the Employment Appeal Tribunal in Germany. Generally speaking, there are two kinds of contracts under German employment law: contracts of service (§ 611(1) German Civil Code) and contracts for service (§ 631 German Civil Code), better known to the layman as an employment contract and a service contract. 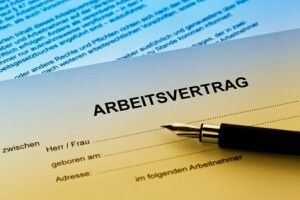 The German Employment Appeal Tribunal recently held that if a contract requires a particular activity to be carried out regularly, as opposed to performing a specific task for a short time or achieving a specific result, then the contract is an employment contract (judgment from 25.09.2013, case ref. : 10 AZR 282/12). The subject of a contract of service or employment contract is the activity itself. The employer gives instructions to the employee as to the duties to be fulfilled. There is mutuality of obligation; an employee is obliged to carry out their duties, an employer is obliged to pay a salary, possibly pay benefits and to take managerial decisions. The employee is also integrated into the structure of the company and must bring personal service. Contracts of service on the other hand, describe the obligation to undertake a specific task or to achieve a particular result. The contractor acts independently of the “customer”. When considering whether an employment relationship exists, the courts consider all the facts of the case. It is the substance of the relationship that counts and if a contract contradicts reality, the courts will rule the relevant clauses to be void. In the above-mentioned case, a dispute arose between a claimant and Bayern’s Regional Office for the Protection of Monuments (BLfD) as to whether an employment relationship existed. The claimant had worked intermittently for the defendant since 2005. He had always worked under so-called “service contracts”. In the most recent contract, the claimant was tasked with collecting data on ground monuments and to enter the data in a computer system in preparation for a re-classification project. Apart from working at the location where relevant files were archived, the only place where the claimant could carry out his task was at the BLfD’s office. The claimant regularly worked from 07:30 am. to 5 pm. He used a computer and desk provided to him to access the computer system using personal login details. He did not possess a key to the office. The deadline for completing the task was calculated based on the number of known archaeological sites and set for 30 November 2009. The parties agreed that the payment of €31,200 would take place in instalments of €5,200 after completion of each geographical area. Germany’s Federal Employment Appeal Tribunal found that an employment relationship existed. The judges ruled that the substance of the contract did not regulate the creation of an object or the achievement of a result, but laid down the framework for the exercise of an activity. Indeed the claimant was obliged to follow the BLfD’s orders and to fulfil his duties personally. Although the distinction between an employment contract and a service contract can sometimes be a fine one, it is reassuring to know that the courts are prepared to consider the substance of the relationship as opposed to just the wording of the contract that exists between the parties. Always interesting to read about the basis of contract law in different jurisdictions, although the basics are quite similar in the Netherlands, thanks for sharing!